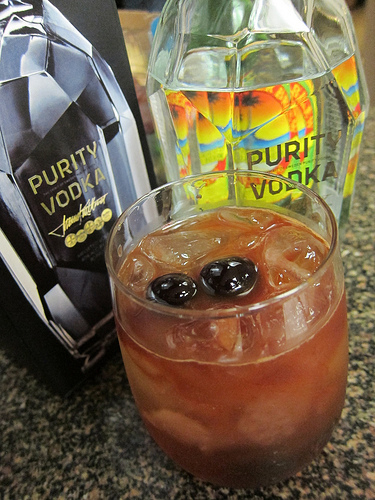 Several weeks ago I received a bottle of Purity Vodka. I decided to play with the vodka with some goodies I got at Tales of the Cocktail. I gathered up some fresh mint, grapes, Angostura Bitters, tart apple shrub from Shrub & Co, cherries from Filthy Food, organic minced ginger from The Ginger People and ginger beer. Although I didn’t have a particular cocktail in mind, I make cocktails a bit like how I cook. I experimented with flavors until I found something I like. 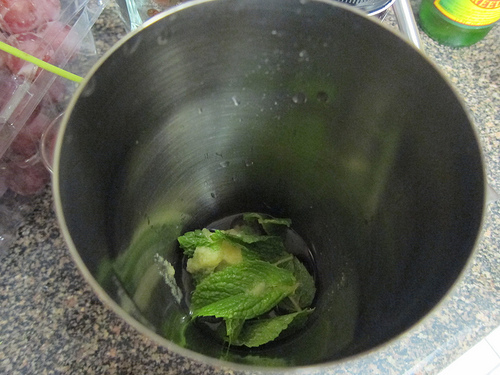 First added a barspoon of the organic minced ginger from The Ginger People along with 10 or so fresh mint leaves into a shaker. I also put in about 6 halved and seeded red grapes. I muddled everything before adding 2 oz of the Purity vodka and .75 oz of the tart apple shrub from Shrub & Co. After shaking until my tin was frosted, I poured everything into a glass and added my favorite AZ Bitters Lab Orange Sunshine bitters. 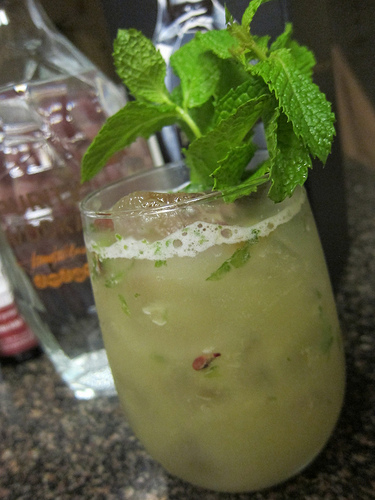 The garnish was perhaps a bit excessive with 2 full sprigs of mint but I am the Minty after all. I call this cocktail the Grape Escape. I was very pleased with the lightness of the drink. The grapes were ripe enough so I didn’t need any simple syrup. I also liked the bit of spicy ginger kick and the shrub was the perfect amount of acidity. For my next drink, I decided to go with the classic Moscow Mule but with a twist. 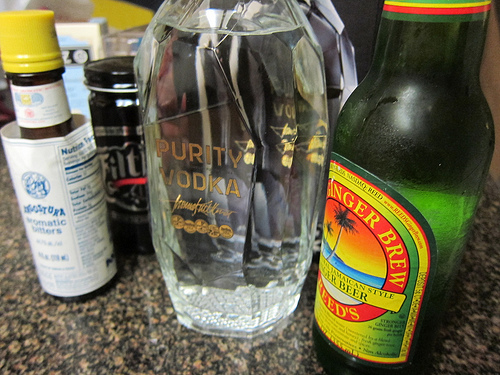 After adding 2 oz of Purity vodka to the glass with ice, I topped it with ginger beer. Then I added two barspoons of the liquid from the Filthy Food cherries and enough Angostura to make me happy (about 6 dashes). Give it a quick stir and add the cherries for a garnish. I used a clear glass to show the drink but I would drink these out of my metal cups next time. My only change is to actually add lime juice and maybe a teensy bit of simple syrup. The ginger beer I use is on the drier side so it’s not very sweet. 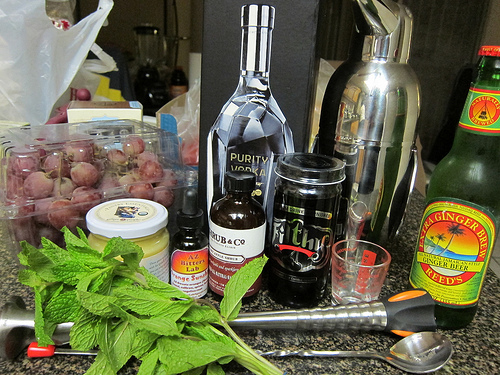 This entry was posted in alcohol education, alcohol tasting, bitters, cocktails, la, la cocktails, los angeles, spirits, the minty and tagged angostura bitters, az bitters lab, bitters, cocktail recipes, cocktail testing, filthy cherries, filthy food, grapes, muddling, purity vodka, shrub & co, tales, tales of the cocktail, the ginger people, the minty, totc 12, vodka. Bookmark the permalink.